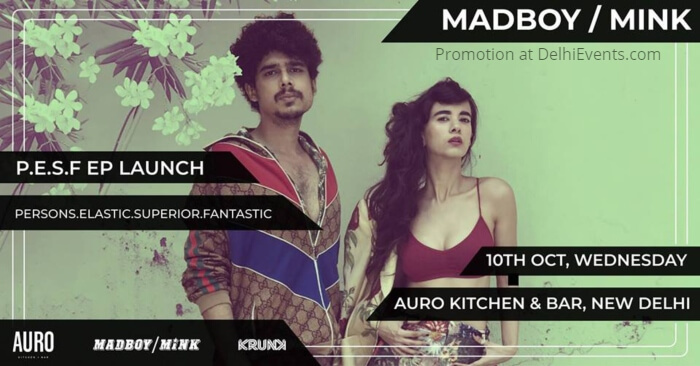 MADBOY / MINK are a duo based out of Mumbai, India. The group features musicians and actors Imaad Shah (guitar, synthesizers, bass, production) and Saba Azad (vocals, guitar, percussion). They have over the last few years evolved into a wildly popular electro-funk duo, making their own trademark brand of electronic music. Their style draws from electro, Indian disco, post-punk, new wave, Indian film scores from the 60s & 70s, acid house, cosmic disco, cabaret punk, funk, soul, Delta Blues but they craft a sound and style that is completely their own, and one that defies genre classification. Since 2013 they have released three EPs, ‘All Ball’, ‘Union Farm’ and the newly released 'Persons.Elastic.Superior.Fantastic' and have toured constantly playing to audiences across India. They have also played around the world in cities like Oslo, Prague, Amsterdam, and Copenhagen. They have been a part of the line-up at almost every major music festival in India including all the editions of Bacardi NH7 Weekender, Magnetic Fields Festival, SUNBURN Festival, Echoes of Earth Festival.